It is not the form that dictates the colour, but the colour that brings out the form. 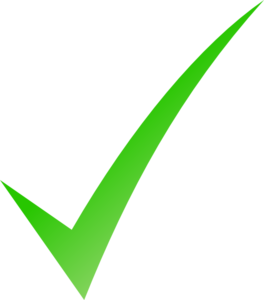 Fifty percent of the success of a client’s total visual image results from wearing the right colours. As image consultants and stylists we know that regardless of style, perfect for a client’s body shape and age, if it’s in an unflattering colour it will instantly sabotage their appearance. That’s where Image Innovator’s COLOUR ID program will enhance your services. 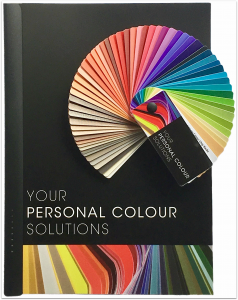 It’s our belief that no colour consultation is ever complete without providing clients everything they need to remember and adapt the information into their daily lives. This includes both a colour swatch and also all the information covered during their consultation. We have built our high standing reputation by producing high quality, innovative image products and training that deliver more than expected. Our COLOUR ID program is a perfect example of our philosophy. – the lifestyle the colour is most suited to e.g. business, casual, active, etc. 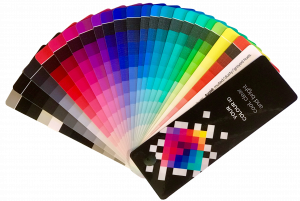 Our COLOUR ID program has been created to allow for individual personalising of a swatch to perfectly suit a client quickly, easily and with accuracy. 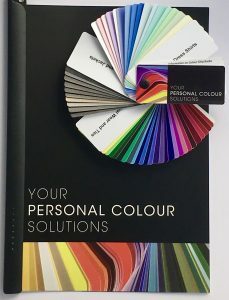 Within the personalisation process consultants use our unique ’colour continuum’ charts to ensure all colours selected are perfect for the client. Female swatches have the colours arranged as per the colour wheel. Male swatches have the colours divided into: dress shirt colours, suit, pants and jackets colours, casual wear and ties colours. We manufacture and print our swatches at our own printing facility to ensure their quality. Swatches sold to North and South American consultants are in US English and are shipped from Michigan. Swatch kits are also available in Spanish. Specially manufactured red or black swatch bags are also available to house the swatch in. For swatch purchases over 20 at one time a free swatch bag per swatch is included. Swatches and accompanying full colour manuals may be branded to your business with full colour personalised covers for an additional modest fee. Created in 2018 ombre swatches have been created to meet the demands for a lower cost, lighter unisex swatch. These swatches contain 21 chips and around 210 colours. They have a rivet closure and no information on the back of each chip. No personal branding or neoprene bags available at this time. All swatches are printed on high quality paper using quality inks and are laminated with a semi gloss linen pattern. Each swatch is closed using a child proof pin. If you have not trained with us we recommend you purchase a copy of our colour training manuals. Housed in 2 binders, our full-colour manual containing over 400 pages of high value, multi-racial colour education. It has been noted as ‘one of the best colour training resources available anywhere’. Our drapes are specially dyed and manufactured for us. Each set contains 56 drapes which are divided into four fabric sets and one metallic set. Our coding drapes have been created with the consultant in mind; they require no wasted time or mess looking for drapes from one set to use in another. As you finish with one set you put it away. If a colour is needed a second time we provide it again in subsequent set. Drapes have labels on the back indicating their Set, Group, Name and Temperature. Drapes are hand washable and dry cleanable. Drape sets come with full instructions and procedure pages. Specially made drape sets bags may also be purchased to keep your drapes clean and tidy. CLICK HERE to learn more about the membership benefits options.